Main Street in Seal Beach has been a favorite subject for photographers throughout its 95 years of history. Every Monday between now and the end of the Seal Beach Founders Celebration, we’ll be posting a different image of Main Street. This week’s Main Street image comes to us care of a past Seal Beach resident, Bob Robertson. The photo was taken by Bob’s father, Bill Robertson, owner of the Seal Beach Post and Wave newspaper. It’s been about forty years since last week’s image, and much has changed. Main Street is much more familiar with businesses that still run today. On the right, the once familiar liquor arrow points to Seal Beach Liquor on the right at 112 Main Street, and across the street Clancy’s Saloon now fills the spot that Mamie’s and the Seal Beach Pharmacy once did business. Note that the service window from the Seal Beach Pharmacy is now only decorative, probably remodeled during the Mamie’s period or before. Guy’s Burgers has been built where the red cars used to turn off Ocean Avenue on to Main Street, and the Bayside Land Company building still stands behind it. Both buildings are now long gone. 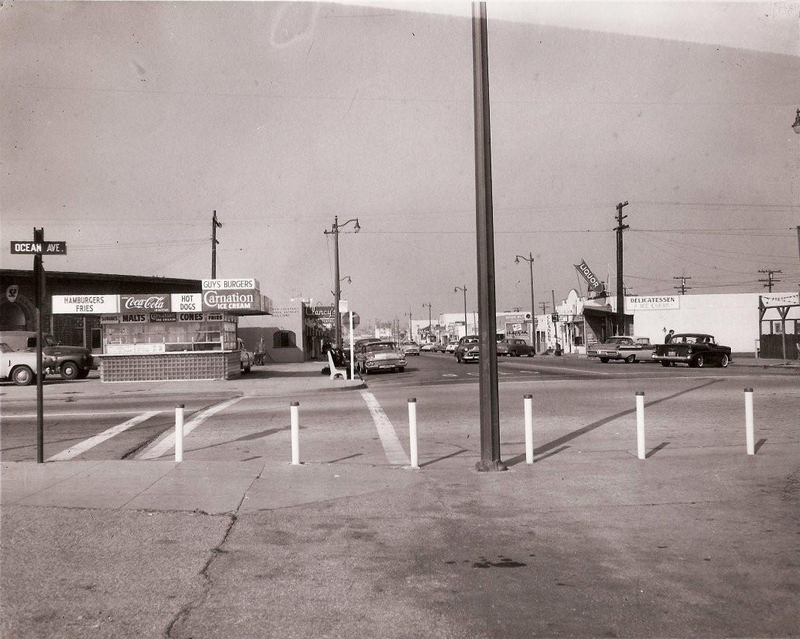 This entry was posted in Seal Beach History and tagged 1950s, Bayside Land Company, Clancy's Saloon, Guy's Burgers, Main Street, Mamie's, Seal Beach, Seal Beach Liquor, Seal Beach Pharmacy. Bookmark the permalink. Michael, great picture! So many of these were before my time and each picture gives me the ability to travel back in time. What an awesome experience made possible for all of us by you and those that contribute pictures to your blog. Thank you for sharing!